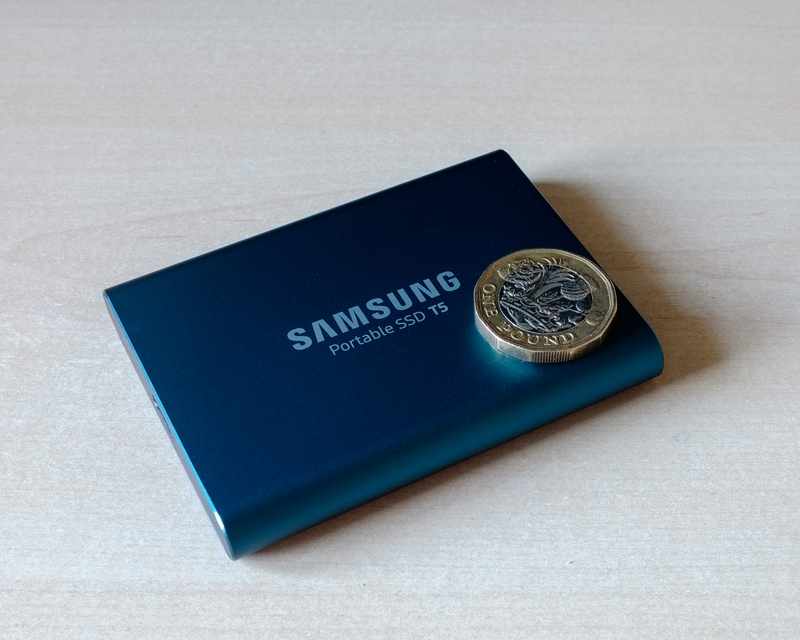 Samsung T5 USB SSD with £1 coin for scale. I’ve recently invested in some new computer kit and changed the way I work with my photos in Adobe Lightroom. I built myself a new tower PC a couple of years ago and that has been my “digital darkroom” ever since. It’s powerful enough for my needs with an i7 processor, a reasonable wedge of memory and fast PCIe connected SSD. However using it means shutting myself away in my “den”. Sometimes that’s fine, other times I’d like to be able to work in the living room, at the kitchen table or for that matter in a hotel room. I did have a laptop with Lightroom installed on it but it was a separate catalog. If I imported my photos on the laptop to work on them I would then later export those photos and import them back to my main catalog on the desktop machine. This worked, but it was a more laborious process than I wanted so I didn’t work that way very often. I explored the idea of storing my Lightroom catalog and more recent photos on a USB hard disk. This worked pretty well. I had for a long time held archives of photos from previous years on a NAS so that they could be accessed by multiple devices, albeit rather more slowly than anything which was held on local storage. With my catalog and recent photos on an external drive I could now swap between the desktop machine and the laptop and just carry on working from where I was before – same photos, same edits, same presets available. As long as I’m at home then my full archive of photos is available on the NAS device. If I’m away from home, working on the laptop then all I’ll have is my recent photos. Although this solution worked it could feel a bit sluggish. This was only to be expected with storing the Lightroom catalog files and the photos on a USB hard drive. Transfer speeds of around 100MB per second don’t match up to the sort of speeds obtained from an internal PCIe attached SSD. However with an external USB SSD that 100MB per second could be increased to something more like 500MB per second and with Christmas coming around I had gift money to spend so I invested in a Samsung T5 250GB external SSD. I had to further reduce the number of photos I kept on this drive so that now everything but the last 3 or 4 months worth of shooting is on the NAS but the extra speed when working with current photos was worth it. In addition to being roughly five times faster, the Samsung T5 is much smaller and lighter than a conventional USB hard drive. This coupled with a 13.3″ laptop and my Fujifilm X series cameras makes for a really very small and light travelling kit compared with what I would have had to take with me previously. Due to the obviously very portable nature of a laptop and small, light external storage I feel that encryption is very important. If I lose the laptop or it’s stolen then I want to make sure that the most important asset, the data, is protected. The SSD internal to the laptop is encrypted using BitLocker provided by Windows 10 Pro and the external T5 SSD comes with its own encryption solution. Of course I also protect my data by having multiple backups with at least one copy being held off-site at all times. All of this is great and it enables me to work with my photos the way I want to but now of course I need to get out with a camera and take more photos! I don’t really “do” New Year resolutions but if I did they would have to include getting out more, taking more photos and blogging more frequently. I managed to drop my portable hard drive, completely defunct now, must investigate getting an SSD. Ouch! That is another benefit of an SSD – less vulnerable to shock damage.